Today’s release of Jetpack 5.8 includes several features that have graduated from beta testing. We are very excited to bring them out for you to try. Let’s take a closer look at what we’ve included in this update, and how today’s additions will help you speed up your site and deliver faster, more relevant content to your visitors — always a good thing! The most exciting news first: all Professional plan customers will now be able to use the new Jetpack search service, which replaces the default WordPress search functionality with an Elasticsearch-powered service. This delivers more relevant results with powerful filtering options and unmatched scalability for sites with large amounts of content. For sites that have a large number of posts, pages, or products, you will see significant improvements to both the speed of searching through the site, as well as to the relevance of the results returned. For site builders, you can configure our sidebar widgets so that users can refine their search by any categories, tags, month/year, post type or any taxonomy. For developers, we expose the full power of Elasticsearch under the hood — send custom queries or use our template tags to customize the end-user search experience. Learn more about this feature on our support page. We received a ton of fantastic feedback from customers who tested this during the early stages, and we’d like to give our heartfelt thanks to everyone who submitted their feedback, test results, and ideas for improving this integration prior to today’s official launch. Sites that have a large number of images — like photo blogs, travel sites, and online stores — have a new feature to try out that may significantly speed things up and lower their bounce rates. We’ve implemented a lazy loading images feature into Jetpack 5.8, which significantly reduces page load times for end users. Lazy loading images work in this way: instead of waiting for the entire page to load before displaying it to a visitor, Jetpack will instead show the page’s non-image content as quickly as possible (usually instantly). Jetpack then requests and downloads images on the page when the user scrolls down, so they’ll appear right as the user gets to that point on the screen. Combined with our existing image CDN, this has the potential to speed up media-heavy sites dramatically. We’d love to hear your feedback on it if you give it a try. About a week ago, we quietly rolled out some changes to our Premium plan. The keen-eyed among you may have already spotted the changes or new features in your dashboard, but if you missed it, here’s what’s new. Previously, there were some minor differences in the security offerings between our Premium and Professional plans. But now, Premium customers have access to on-demand security scanning and automated threat resolution. We’ve also lifted the 13GB restriction on video uploads for the plan, so Premium customers now get unlimited video uploading and streaming services. Jetpack’s video hosting service is designed and optimized for WordPress, integrates directly into the media library you use on a daily basis, and—best of all—is completely ad-free. It uses the same CDN as our images, so it’s blazing fast. If you haven’t already tried it, now’s a great time to experiment! Finally, we’ve made all of our SEO tools available to Premium customers. You can now preview and optimize your site content, or get in-depth stats with our seamless Google Analytics integration. We think all of these additions make our Premium plan an even better value for WordPress users. At just $99 annually, it’s the most affordable way to get best-in-class security tools, super fast photo and video hosting, features that will improve your site traffic and search engine rankings, and so much more. Not a Jetpack Premium customer? We also have a major improvement coming for Jetpack Personal that we’ll be ready to announce in just a few weeks. Keep an eye on your dashboard for an important notice soon! Support has been added for site language and timezone settings. We’ve improved the display of notices inside the Jetpack dashboard. The GettyImages shortcode has been updated to use the new format required by GettyImages. For Premium and Professional customers using our ad program, we’ve now enabled the ads in the header by default. We’ve also added filters so you can control the display of the ads via code. We’ve improved the display of the Development Mode notice. As always, you can see a list of the additions, updates, and bugfixes in this release by reading the changelog for 5.8. If you have any questions about these changes or feedback on the new features, please get in touch and one of our Happiness Engineers will gladly lend a hand. Install Jetpack or upgrade to 5.8 today to see just how fast your site can go! Adam Zielinski, Alex Mills, Anna Magdalena Kedzierska, Bernie Reiter, Daniel W. Robert, Daniel Walmsley, Derek Smart, Derek Springer, Elio Rivero, Enej Bajgoric, Eric Binnion, Greg Ichneumon Brown, Igor Zinovyev, James Nylen, Javi Alvarez, Jeff Bowen, Jeff Golenski, Jeremy Herve, Joell Lapitan, Jon Surrell, Marin Atanasov, Matt Wiebe, Michael Turk, Miguel Lezama, Mikael Korpela, Nicole Kohler, Oscar Lopez, Peter Westwood, Richard Muscat, Rob Landers, Rocco Tripaldi, Rodrigo Iloro, Sam Hotchkiss, Sanket Parmar, Scott Hartley, Simon Prosser, Stephen Edgar, Umang Vaghela, Victoria Holland, Jonathan Sadowski, and Philip John. 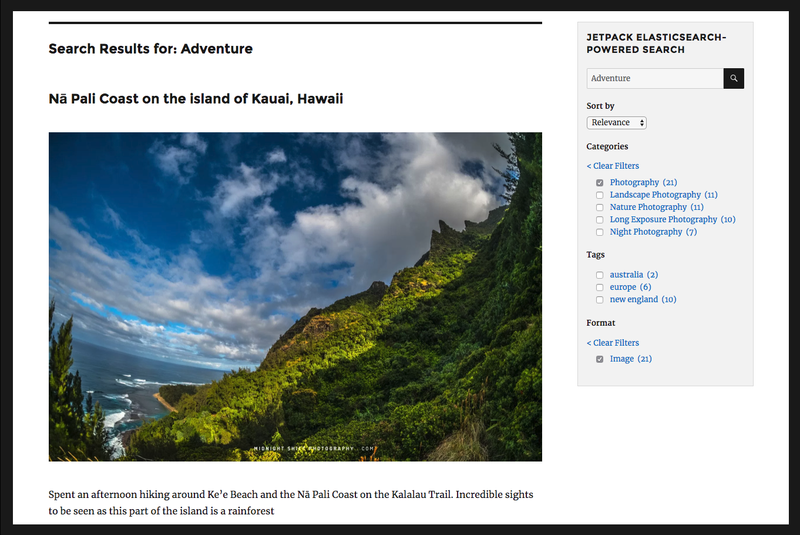 This entry was posted in Releases and tagged elasticsearch, jetpack 5.8, Jetpack Premium, jetpack search, lazy images, release. Bookmark the permalink. Great to see more changes to Jetpack, especially in relation to speed. Thanks, everyone! for my theme Juxter free – jetpack lazy load add big blank object under image slider. Love to see new jetpack focuses on speed rather then any because speed really matters when website loads slow. Awesome guys, I have been wanting this for a while. I was able to uninstall the other plugin that was just for lazy loading. Keep up the great work JetPack team! … to customize exactly when images will be lazy-loaded vs. when they will be loaded normally. I know that native WordPress search got significantly better in 2013, but I’m still using the plugin Relevanssi. With a large content-heavy site, we wanted more control over how results are weighted. For example, to prevent a blog post on a topic from ranking higher than the overview information in a static page. I’m wondering how Jetpack Elasticsearch compares, and if it would be even better for those needs? Jetpack Search does allow full control to override the Elasticsearch query. We do not currently have any UI in the admin to allow adjusting it though. In general, I think hand-tuning parts of the query is pretty hard to do, and so adding UI for that would not be very beneficial and would be confusing for most users. As we get data from more sites I am also planning to experiment with the defaults to try and improve the default query. So I don’t want to add a lot of UI for something that is likely to change a lot. I could use all the help I can get with my blogs. Thanks Jetpack!!! Thanks.. I was waiting for such features. Keep it Up . We don’t currently support Jetpack’s SEO settings in the mobile apps, so I’m not 100% sure what you’re referring to here. Can you reach out to our support folks for help with this? I think we’d like to get a screenshot of exactly what you’re seeing in the app. Thanks! Wow, I’m happy to hear this news. I also use this, it helps much to my blog too. Fantastic news! I worry about slow load time on my site and not being techie I didn’t know what else I could do to improve it. Quick question though, do I need to do anything to implement the Lazy Loading? Awesome Sharing by Jetpack, I love your plugins. Faster search will surely decrease response time on database heavy career and jobs website in India like ours. Also lazy load will drastically improve page load time. This news is very good for us. Our websites will load quickly. Loving the image lazy load feature. Thanks Jetpack. Great Improvements! Provide the new search service for free, make it one of the free strong features of WordPress and jetpack. Great to see the focus on speed as this one aspect remains critical for achieving all web site goals; from search ranking, to customer retention and engagement. So, a great big thank you!. My hope is that web site performance remains a primary forces for Jetpack. Finding a way to manage the substantial feature rich monolith whilst achieving site and page load performance goals is still this customer’s number one request. Going further, I’d love to see Jetpack adding page performance monitoring and optimization features along with continuing to provide improved architecture and features, tips and guides all aimed at enhancing speed. Great to see a new feature that focuses on speed from Jetpack, I really like the free CDN offered by this plugin. One of the great Improvements! Provide the new search service for free of cost, make it one of the free strong features of WordPress and jetpack. Has this lazy load feature been tested with the divi and extra theme from Elegant Themes or will i risk breaking the site? The feature should work with most themes, and we did test it with Divi. If you run into issues though, don’t hesitate to let us know via this form! The Widget should appear if you have enabled the Stats feature on your site, as well as the Extra Sidebar Widgets feature. Could you go to Jetpack > Settings in your dashboard, search for both features thanks to the searchform at the top of the page, and make sure that both features are active? That should help. I can protect my video to only show on my domain? You can disable sharing so your readers can’t easily embed your videos on their own site, but it is still possible for someone to download the video from their browser. If you need to fully protect your videos, we would recommend that you consider other providers that offer private videos as one of their services.